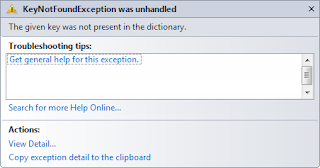 No surprises, dictionary is not thread safe. But what if you're using it with guaranteed unique keys; ie each thread is guaranteed to be accessing it with a key unique to only that thread? So what is happening here? As the dictionary gets larger the it will need to change its internal storage to increase its size, when this occurs another thread will either corrupt it or access stale data. So bad news. The morale of the story is always add a Console.WriteLine before accessing a dictionary. Just kidding. If you think there will be any sort of multi-thread contention use a ConcurrentDictionary instead. Just simply by thinking each thread accessing the dictionary using a guaranteed unique key will not suffice.